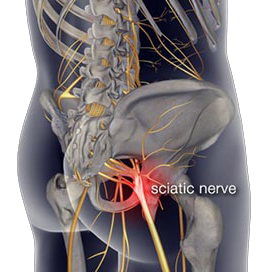 Sciatica is the irritation of the sciatic nerve, which is the largest nerve in the body. It begins with several nerves in the lower back and travels down the legs. The irritation of the sciatic nerve can originate from a herniated disc, inflammation, bone spurs or foraminal stenosis. The pain associated with Sciatica – sciatic nerve pain – occurs when any or all of the above mentioned conditions compress the nerve roots or spinal cord. At Spine & Orthopedic Center, our multi-disciplinary team of spine specialists provide the leading sciatica treatment center in South Florida. We focus in proper diagnosis and a wide array of treatment options through our multiple offices in Boca Raton, Coral Springs, Deerfield Beach, Plantation and Fort Lauderdale. Our team can provide both non-surgical and minimally invasive options. Call us 24/7 at 888-409-8006. The most common Sciatica symptoms include pain, weakness, or numbness in the buttocks or leg and a burning or tingling sensation down the leg, and pain worsening when sitting. Severe sciatic nerve pain can make walking very difficult for some patients and the sciatica symptoms can be aggravated by walking or bending at the waist. There are several non-surgical and surgical sciatica treatment options, but they are related to the spinal condition or disease affecting the sciatic nerve. Our spine specialists have decades of combined experience in the treatment of sciatica in Broward and Palm Beach. Most of the time and depending on the cause of pain and the patient overall health, the most common non-surgical options involve anti-inflammatory medications (NSAIDs), hot and cold therapy, physical therapy or epidural steroid injections which are normally indicated for pain management. Please, be aware that surgery is not the only way to treat painful sciatica symptoms. Physicians may consider surgery for those patients who do not improve with conservative treatment and show significant weakness or loss of function. It is important to remember that the surgical options for sciatica not necessarily involve the sciatic nerve itself, but dealing with the condition that is causing pressure in the sciatic nerve such as disc herniation, bulging discs, stenosis, disc generation, etc. Please find below the most common surgical options when sciatic pain is involved. This surgical procedure involves removing all or portions of the lamina, removing bone spurs and/or enlarging the foramina to relieve pressure or compression on the nerve roots or spinal cord. This pressure is often what causes pain. Often times, in addition to a decompression, your surgeon will perform an instrumented posterolateral fusion by inserting a series of screws and rods coupled with the placement of bone graft. This fusion provides increased spinal stability. The surgical approach is from the front of the abdomen. 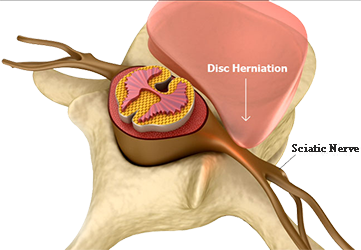 Once the exposure is made, your surgeon will use surgical instruments to remove the disc material that causes the nerve compression. Once this material is removed, an interbody cage or bone spacer is placed at the disc site filled with bone graft. The vertebral bodies above and below are frequently put under compression to aid in the subsequent spinal fusion. The same procedure as the ALIF but the approach and exposure are performed from the back. Just as in an ALIF, the surgeon will remove the disc material and insert an interbody device. Compression through the use of pedicle screws is frequently achieved to aid in fusion.